Only in my family could we sit round the breakfast table eating sausages and criticising and commenting on every aspect. We are a Powter’s family – not that we have any Powter blood in our veins apart from the amount of their pork sausages we have consumed over the years… no we are tried and tested 100% loyal Powter’s pork sausage and chipolata devotees. When the sausage is cooked, the texture should have bite, should not be so finely minced that its like toothpaste, nor so solidly meaty that it is not sausage meat but finely minced pork. There should be sufficient fat to tenderly cook the sausage from the inside and the sausage should be moist and juicy but not wet or sludgy. I prefer to gently fry a Powter’s sausage, it results in a more tender sausage, the skin cooked but not hard. To me, grilling or cooking in the oven dries the fine sausage and the skin becomes stiff and chewy. The sausage when cooked should be various shades of brown on the outside and grey on the inside – and only the slightest hint of pink. The sausage should be equally delicious when cold. Sometimes little burnt bits, all caramelly and chewy attach themselves to the sausage – fine by me! Powter’s have a devoted following and although their rivals, Musk’s, are also good sausages – a very good second best, they are just not as good as Powter’s. Apparently, Powter’s started in Newmarket in 1880; certainly by the time my father Donald was growing up in the 1920’s Powter’s was THE Newmarket sausage and was always eaten by the Elsdens … but only by some of the family. Donald and his father Rue would eat Powter’s Maudie and either Sid or Joan would only eat Musk’s… and they say people are fussy eaters now! If sausages were served at breakfast in the Elsden family they would be eaten on their own with a special thin gravy… although I am not sure how that would have been made. Sausages would not be part of a bigger breakfast, they would just be on their own. As an evening meal or for lunch they would be eaten with mashed potato and some other vegetables no doubt and then thick gravy could be served. The only condiment would be Coleman’s English Mustard – made from powder and served in a mustard pot with a little mustard spoon. The only recipe using sausages would be toad in the hole. So one morning in 2011, we sat at breakfast in Ely, my cousins and Bari and I, eating Powter’s sausage with Real Ale. There was a ‘generous 10%’ of beer – the delightful Green King Abbot Ale included in the sausage mix. It had been a kind gift to cousin Carolyn from Powter’s in Newmarket, in appreciation of the custom she gives the business… so we thought we would try them. Powter’s Real Ale sausages had the appearance of a traditional sausage although cutting into them the mince seemed finer. The texture in the mouth was very soft, pappy, wet and not altogether pleasant. There was a definite taste of ale, a certain dull sweetness, but there was a lack of the usual pepperiness which so enhances the traditional sausage. The skin seemed brittle and hard and yet chewy… the sausages had been grilled, but cousin Simon always grills them and the skins are not as they were on these real ale sausages. A long discussion ensued and every bite analysed. We even looked at the packaging to see if there was more water than usual, or more rusk to hold the ale, or less meat… but the proportions were the same as usual. Any other family would have eaten the sausage and said ‘thank you very much, delicious,’ and indeed they were good, very good … but to our finely tuned sausage palates they were just not as good. So that will be the first… and I hope the last Real Ale sausage! 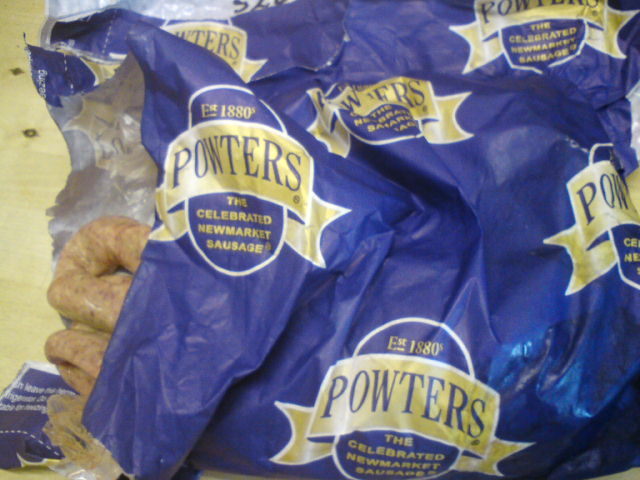 Just to prove it was an aberration we had regular Powter’s sausages for dinner… perfect, and delicious! Lois, have just come across your acclaimed blog via google images – i am delighted that you and your family are such passionate Powters Sausage fans and will now follow you here. We share not just an interest in fine tasting food and real ale but also good writing. Your article is where i shall look for inspiration when i’m lost for words to describe Powters sausages – great to read when i need reassurance that our sausage is still something my great grandfather would be proud of! Grant – hi, gosh, I’m in awe of having an actual Powter comment here! Your sausages are legendary in our family… we have some in our freezer right now, and next time we go to Cambridgeshire we will stock up again! They are an integral part of our family life… there is no sausage anywhere to compare with them!